No way Jose` – the hose is mine! For me it`s definitely real because it`s my own. There`s a garden, something more than 100 years ago it was a small park. You know, that old fashioned one, with a stone pool, a fountain, few palm trees… But until recently, it use to be just a small part of the green area in town, surrounded by stone walls and covered only with grass and weed. Well, few weeks ago, I`ve decided to become a Green guerilla, and to plant there some vegetables. The soil was so damn hard, dry and almost lifeless (if you forget the weed) that I have literally worked my a… off to make it gentle and tender again. Oh, And how soft it is! Even our cats love to lay down there, turn on it and tap it with their little paws! So I bought tomato, cucumber, carrot and lavender seeds, placed it with love and affection prepared for that warm feeling of growing green life to come. And it did. Not so much for other, but tomatoes…. From one small bag of seeds, now I have more than 300 nice, aromatic tomato plants! Am I happy? Of course I am! 300!!! You can you imagine it! Bravo me and bravo tomatoes! What a team! So what`s the problem? Well, for all this time I haven`t managed not even once to take the damn hose and water the bloody tomatoes! I don`t know if you have tried it but actually it`s like a reward after all this work. You take the hose, this lovely gift of nature called water stars running and you feel…. so relaxed. And happy. Beautiful feeling. But howcome the others have discovered it too, some how they always manage to do it before me. It`s incredible! Yesterday I got up at 5 (yes five, can you bealive it?!? 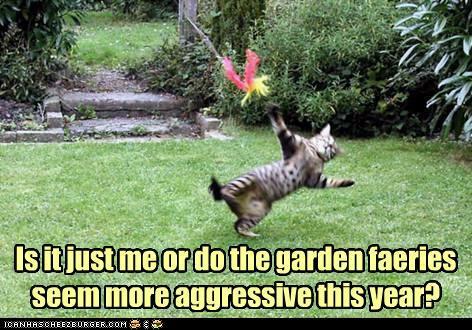 ), had my coffee, bathroom ritual and off to the garden. After few hours, when the work was done and I was preparing to finally water it, there goes my mother with the hose! Aaaaaaaaaaaaa! OK, I realized now I really have a problem. So today I said, „Mom, at 5 pm I (and I have underlined that I) will water the garden“. You know what happened? At 16:45 she came to my door saying that she wants to feed the „poor cats, they must be starving“. 20 minutes later she was on my door again with „I fed the cats, and oh, I have watered the garden!“. Jesus Mary and… What a woman must do over here to water her own garden! I have decided – I still don`t know how and when but I`m gonna take the hose into my own hands! Me, not others. No way Jose`! The hose is mine! P.S. I just remembered, maybe I should use, for those 300 plants, the approach „This is Spartaaaaaaaaa!“ line. Or „back off from the hose Jose`“. You never know. Or to take the hose and arange them a nice cold shower. Because I deserve it, 44.
i was laughing the whole way through! hope you get to water it soon!